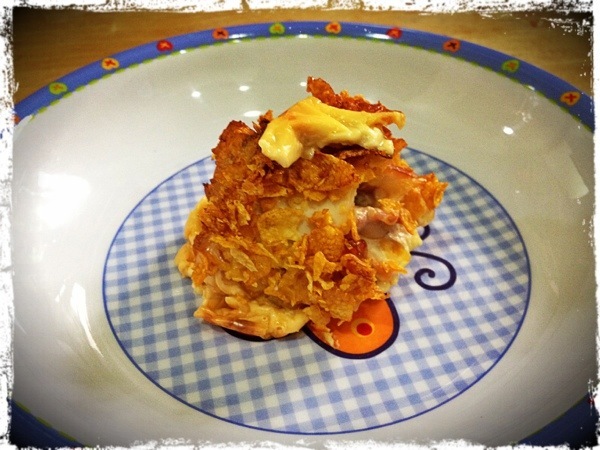 A typical Cordon Bleu involves seasoning the chicken with herbs and condiments. Then bake it in gravy for a while so that it absorbs all the rich taste. Then combining it with bacon and cheese before cooking it again. It’s a multiple stepped dish. Well lazy me just simplified it to a few steps. Lay the chicken breasts nicely in a row. If they are a wee too thick, you can pound them down to desired thickness or slice them down. Lay the bacon over the chicken. Then lay the cheese slice over the bacon. I simply used the cheddar slices because they were available in my fridge. Big mistake… They were a trifle too salty. Swiss cheese may be better. Align the slices to the top before rolling them together. Try to fold over the cheese so that it doesn’t flow out while being baked in the oven. Fasten the roll together with toothpicks. Beat up an egg. 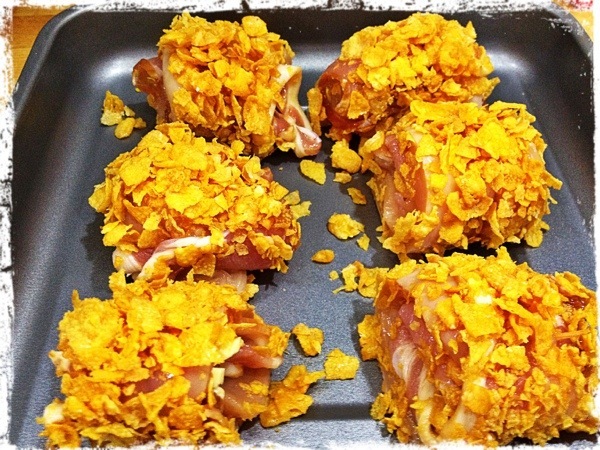 Pour out the cornflakes on a plate and crush them into smaller bits so that they stick better to the rolls. You can use bread crumbs too. Coat the egg dipped rolls with the cornflakes. Line them nicely on a baking tray. Pop them into the preheated oven at 185 degrees Celsius for about 30 mins.